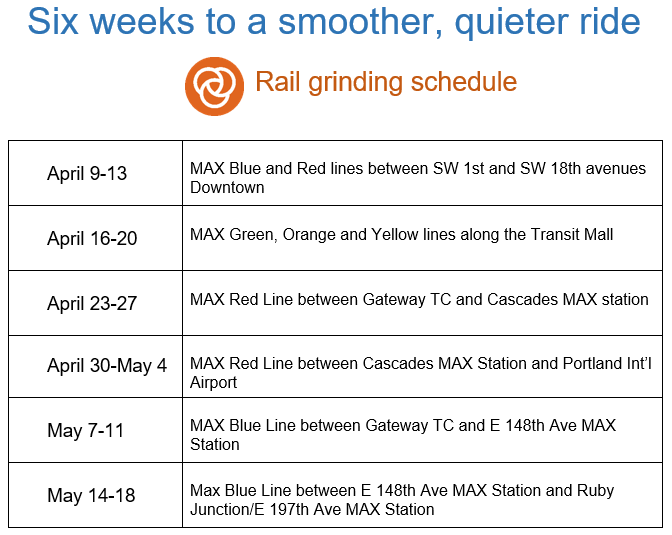 TriMet will begin a six-week rail-grinding project on Tuesday, April 9, that will improve about 25 miles of the MAX system. The result will be a better ride and lowered maintenance costs. The project will be done during overnight hours when MAX trains are not running. The work is scheduled between about 12:30 a.m. and 4 a.m. Tuesdays through Saturdays for the next six weeks. We’ll begin in Downtown Portland then work our way to Portland International Airport and eventually towards Gresham, where the project is scheduled to wrap up Saturday, May 18. 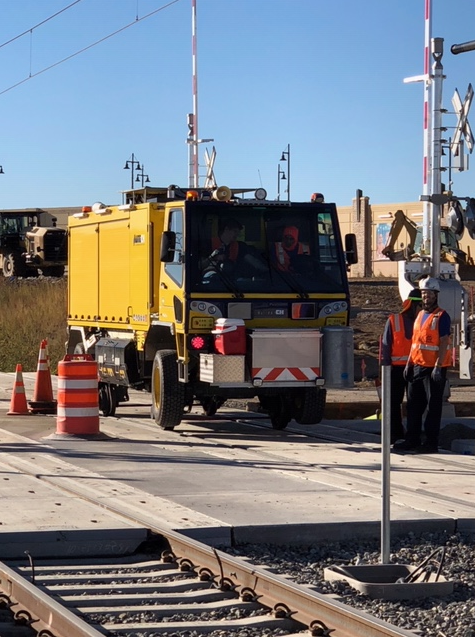 Residents along the tracks may hear the equipment when work is being done. Also, the grinding does generate sparks, so crews will be following necessary fire watch precautions to suppress any sparks that may ignite. MAX trains run every 15 minutes or better, most of the day. That’s a lot of metal-to-metal contact between train wheels and the steel tracks. Wear and tear from regular train activity creates bumps on the rails and flattens out the curve on the top of the rail. That can lead to unnecessary vibration, noise, a rougher ride, reduced rail service life, and increased maintenance work. The rail grinder we’re using—that looks similar to an off-road truck—helps prevent unnecessary wear and tear. It runs back and forth over a section of track to both grind away the bumps and restore the curve to the top of the rail. The amount of time it takes to grind depends on the amount of rail wear. It usually takes several passes of the machine, with adjustable grinder heads that vary in angle each time they pass over the tracks. 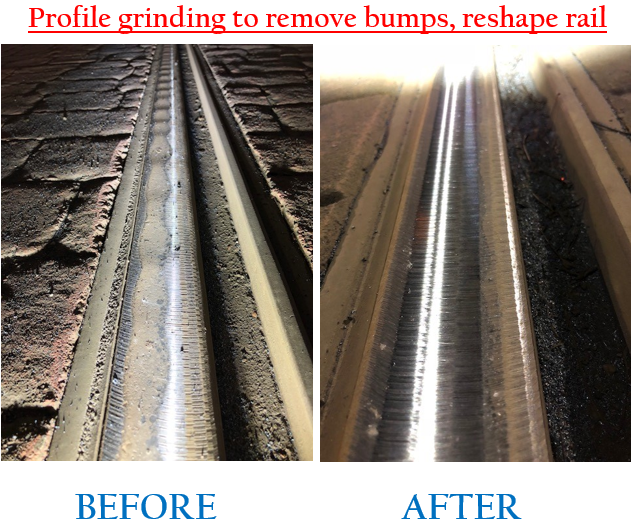 The work, known as profile grinding, will result in a better fit between the steel wheels of the MAX trains and the rails. The end result is trains sway less leading to a smoother, quieter ride, and prolonging rail life which reduces maintenance costs in the long run for the MAX system.